Billy Crudup plays a complicated nobody. Loren Noveck isn’t sure how much to believe him. Philip Brugglestein (Billy Crudup) is pretty much a nobody, other than the fact that, as he lets you know right off, he “could always do an immaculate English accent.” He was raised in South Bend, Indiana, first by parents who casually loathed each other and then, after his mother died when he was a teenager, by a father who was at best baffled by and at worst contemptuous of and violent toward him. He uses a small inheritance from his parents (his father dies a few years after his mother) to flee to New York and reinvent himself thoroughly–and his new persona comes not from the Midwest, but from the UK. In language reminiscent of coming out, Philip claims that his “true voice” speaks with a British accent. He’s only confessed the truth of his origins to one New York friend (after living the lie for something like twenty years), and it went so poorly he promises never to do it again. Still, his life remains pretty boring. He works casual service jobs to stretch out his inheritance, jobs he often does well at largely because people like his accent. But bubbling up under the surface, the whole time, we gradually learn, is an alter ego, the titular Harry Clarke. You could say Harry saves Philip’s life, or you could equally say he destroys it. Though Harry bears more than a slight resemblance to Patricia Highsmith’s famous Tom Ripley, Ripley’s assumptions of alter egos always felt actively aspirational; Harry feels more like a charismatic Mr. Hyde to Philip’s milquetoast Dr. Jekyll. Harry is everything Philip is not: Cockney to Philip’s more genteel (but equally faux) British suburbanite, ballsy where Philip is timid, (fictively) successful where Philip is a wishy-washy failure (in one of the play’s randomest details, Harry claims he was Sade’s personal assistant/manager for twenty years), aggressive where Philip is self-deprecating. At the beginning of the play, Philip claims that he never really chooses to be Harry; Harry merely appears in unusual circumstances: such as when he randomly decides to follow a stranger around the city for an afternoon, and then encounters that man again across the aisle at a play. Thus begins the series of relationships that will change Philip’s life–not just with the man, Mark Schmidt, a recently divorced rich guy looking to change his own life, but with Mark’s entire family. All of Harry’s stories, taken together, add up to a man who’s at best an amoral pleasure-seeker and at worst an outright sociopath: if he is to be believed, Harry is irresistible to men and women alike, had more than a little to do with the death of Philip’s father, and is quite capable of manipulating his way into a fortune. But the most intriguing thing about David Cale’s script is that it seems neither Harry nor Philip is telling us the whole story: Philip surely hasn’t been living in New York for more than twenty years on the proceeds of selling a rundown farmhouse in Indiana, so what has he been doing? Has Harry just been laying low all this time? It’s impossible to tell how much we’re supposed to believe him and how much just to revel in his ballsiness and the relish he takes in his own storytelling. Harry’s relish, that is; when Crudup is speaking as Harry, he’s immensely pleased with himself. When he’s speaking as Philip, he’s somewhat horrified and amazed at Harry. As a piece of psychology, I’m not sure it hangs together. As a piece of writing, there’s not a lot new here, although Cale and Crudup bring plenty of gusto and plenty of brash sexiness to a somewhat familiar story. But as a character study and a piece of acting, it’s enormously fun, with dizzying layers when Crudup is playing Philip being Harry recounting Mark mimicking his sister or mother. Cale and Crudup have nailed the speech patterns of the Schmidt family–all clearly related but all slightly different, and made them so strikingly different from Philip’s or Harry’s own that even without the accents you’d probably be able to tell which is the physical vocabularies that to match the different character/voices, from Mrs. Schmidt’s coy, girlish gestures to Harry’s slightly aggressive, rangy posture to Mark’s more macho American manhood (you can almost feel Mark man-spreading even when he’s standing up). It’s a trifle, but an entertaining one. Finally, an interesting fact: Harry Clarke is the first production in the Vineyard’s partnership with Amazon’s audiobook brand Audible, which is also a co-producer of John Leguizamo’s current Broadway show Latin History for Morons and will be commissioning $5 million worth of new radio plays to be distributed digitally. 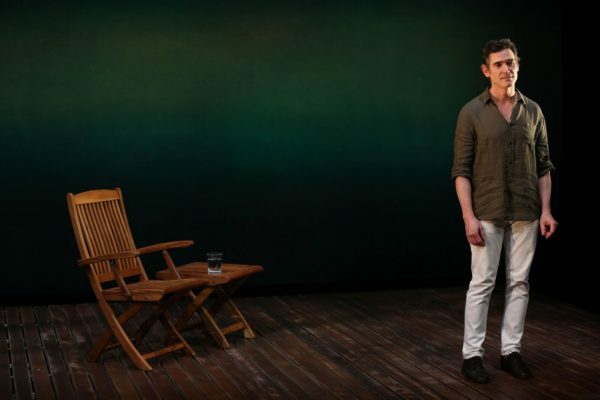 No theater can afford to turn up its nose at innovative funding streams these days, but the granting program’s focus on one- and two-character plays seems like it might end up being a pipeline that generates more of the kind of plays that already get produced. Still, another channel through which new voices can reach a broad audience, and maybe serve as a “gateway drug” to live theater, is something to be excited about. Harry Clarke runs to December 10, 2017. More production info can be found here. Loren Noveck is a writer, editor, dramaturg, and recovering Off-Off-Broadway producer, who was for many years the literary manager of Six Figures Theatre Company. She has written for The Brooklyn Rail, nytheatre.com, and NYTheater now, and currently writes for The Brooklyn Paper and WIT Online. In her non-theatrical life, she works in book publishing.